A Southern Grace: ore-oh no, she didn't! I'd like to thank the maker of muffin cups, who brilliantly made the base the exact size of many types of cookies--Oreos, 'Nilla Wafers, and the like. They're the perfect ready-made crust for many treats. So by now, you probably don't believe me when I tell you I don't like cheesecake. That statement (be it true or not) is irrelevant in this case, as these cakes really taste nothing like cheesecake at all. What they taste like to me is an Oreo cookie that's been dipped in milk until it's reached the point of perfect sogginess softness. In my opinion, that's all kinds of yummy. This recipe comes from Martha Stewart's Cupcakes , which has yet to steer me in the wrong direction. If you want a cool, creamy bite that's quick and easy to make and tastes everything like Oreos and very little like cheesecake, give this one a go. Oreos and creamed cheese in one or tow butes..fantastic. These are brilliant, Grace! Dipping oreos in milk to the point of softness/sogginess is perfect in my book! I don't like cheesecake either. Are we the only ones who feel this way? these look great, by the way. YUMM-O....I would so eat at least 2 or 3 of these right this very moment. I'd have to go for the double stuffed oreos. This sounds and looks like a delicious treat. Soggy is just how I like my Oreos! Great combo for a hot day. What a fun blog you have. Ore-oh yes she did! These look awesome Grace. there's nothing quite like an oreo dipped in milk. Delicious! I never thought of using cookies for crust! How dumb am I? Could I do this with the vanilla oreos? AnD Nutter Butters...oh drool. Wow, what a great idea mixing oreo cookies and cream cheese...they look so good! This is one of my fav ways to make mini cheesecakes, nilla wafer on botom and your good! I had an unfortunate encounter with a bag of Oreos when I was five years old that led to an Oreo aversion which lasted for many years. My cousin and I ate an ENTIRE bag of Oreos in one sitting. She would eat the filling and give me the wafer. Thank my lucky stars that I got over the aversion. The bad part is that I somehow felt like I had a lot of Oreo eating to do to get caught up. These cupcakes just look too good to be true. I'm scared to make them. Hold me, please? These look AH-MAZING! And so true about the muffin tins! Yum. I love cheesecake and Oreos. I AM IN! I thought there was nothing in this world more heavenly than my oreo truffles. I think we have just found a contender. Yum! I've never thought of making little cheesecake crusts out of biscuits like that; love it! Well, I'll forgive you for not liking cheesecake...but only because you reminded me that I really want to make these! Martha's Cookies book has never steered me wrong, so I should probably get the Cupcakes book too. 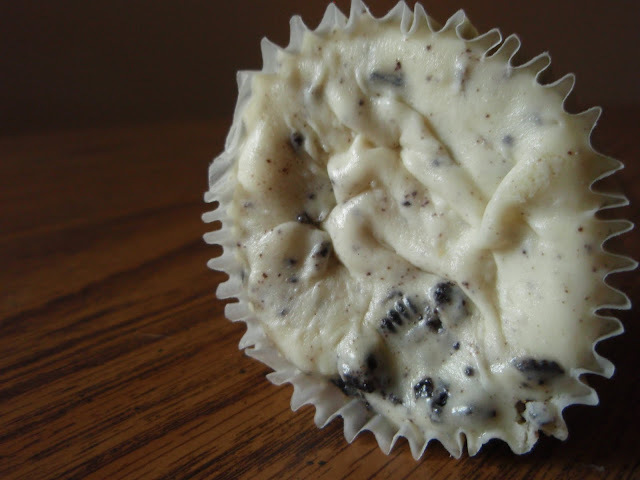 Love the idea of cookies 'n cream in a cheesecake cupcake! These look and sounds incredibly scrumptious! Woooo ... dear Grace looks absolutely amazing and tempting kisses. I am not a huge cheesecake lover but I can tell I would dig these babies. nice cup cake .. like cookies n' cream .. looks so yummy ..
A brilliant idea to use oreo cookie as the base of those mini cheesecake~! I have been dying to make these little cheesecakes, and you have just made me want them even more! These look absolutely delicious and I keep telling myself that I do not like cheesecake, in truth I actually do. Those cupcakes just make my love of deep fried Oreo's move to second place. The soggier the better, I always say. Honestly I use to hate cheesecakes- yeah, that all changed. 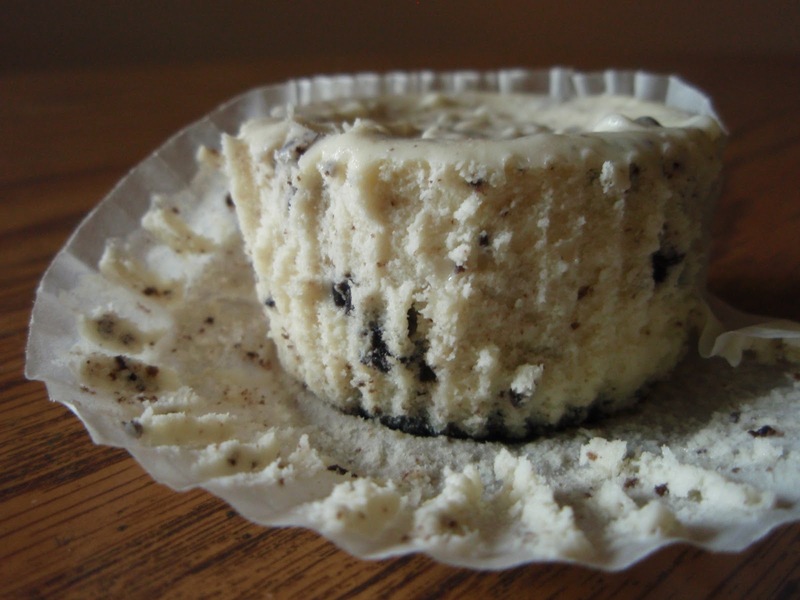 I love oreos- and I am pretty much certain I would love these cheesecake cupcakes!! They look so so good! ;) I didn't know oreos fitted perfectly in muffin cups- haha, I'm tempted to grab some cookies and some muffin cups just to see! The top photo is absolutely stunning. I just want to sit and look at it. I have to get this cookbook, right after I make these cupcakes. Dude, I don't know what it is about oreos, but they are delicious in just about EVERY way, shape and form. Yours most certainly included. Could not resist this fantastic treat! Oh. My. God. Yum. And I love the pictures! We are so behind in tv from being gone for so long. Watching Torchwood, True Blood and Falling Skies right now, but are behind. Did you watch any of those this summer? Can I just say that cheesecake cupcake Oreo thing has me drooling! I've had these on my radar forever! I think they're so cute. And who doesn't like Oreos? These sound amazing!! I cant wait to try them... thanks for sharing yet another awesome recipe! I'm sure these are scrumptious!